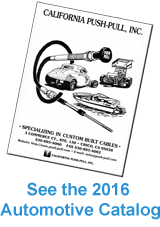 Streetrod - California Push-Pull, Inc.
We are a custom cable house, and stock various control cable components. We a re able to build any type, size or length cable to meet. your requirements. Our throttle and shift cables are highly flexible and of heavy duty construction for long life under rugged conditions. All end rods and support tubes are stainless steel and all components are swagged on for strength. 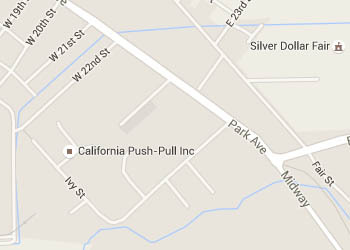 Our brake cable division uses only true OEMstyle flat wound lined housing. All components are swagged, not set screwed. Our brake cables are made to your specifications, we can build your cable from a drawing or old sample. 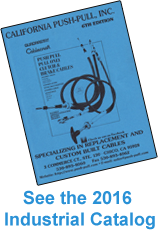 We have a line of specialty cables such as parachute, trim to length throttle and more. 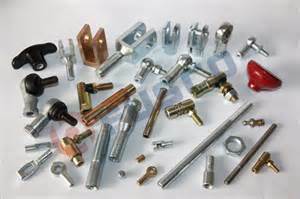 We stock a full line of accessories, from adjustable clevises, quick release ball joints, rod ends, cable clamps and much more. Give us a sample, drawing or print of the cable you need and we will supply you with that cable.